Home is currently under contract but is available to be shown during open houses. New Year Incentive of $5K for a total of $25K off of original list price. ($392665) New price of $367665. Check out Kendale Oaks' newest ranch model, the Somerset. 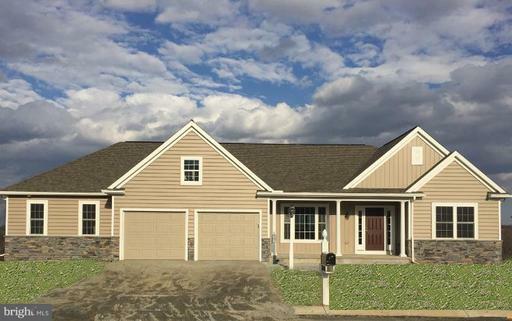 This home includes 2241 sq ft of quality craftsmanship by EG Stoltzfus Homes. Features include: Open floor design, spacious, vaulted Great room w gas fireplace, Dining room with plenty of room to entertain family and friends, eat in Kitchen w island, granite and SS appliances. Hardwood flooring, large Master Bedroom suite with vaulted ceiling, his and hers closets, and comfort height double bowl vanity. Breakfast area opens to a 12x16 Azek deck overlooking the 1/2 acre lot and scenic, panoramic views. If you desire more room, expand on the large, walkout basement offering countless possibilities. All this and more! Stop by and come see the quality of a Stoltzfus home....Come home to Kendale Oaks! Directions: From Derry St, North on Nyes Rd, Left on Conway, Right on Creek run, Left on Beaver Spring, Property on Right.